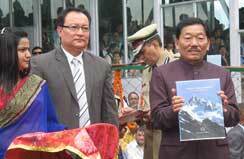 The novel idea of having a comprehensive academic book on climate change in Sikkim was conceptualized by the Chief Minister of Sikkim, Shri Pawan Chamling.The book is unique in the sense that it encapsulates scientific information in an attractive coffee table format. The book has been made possible by sharing of knowledge, based on years of in-depth research in the state by several scholars affiliated to premier research institutes. Also several experts have selflessly contributed their photographs. This book is second in the series after Biodiversity of Sikkim, and is a compilation of a diverse set of 23 articles from eminent scholars and academicians. 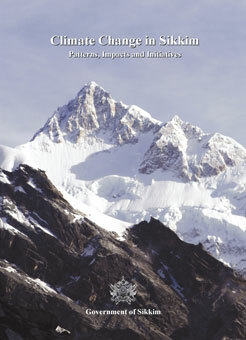 The articles include patterns of climate change, signals and indications, historical perspective, impacts of climate change on forests, glaciers, lakes, environment, flora, fauna, agrobiodiversity, indigenous livelihoods, vulnerability assessment and adaptation experiments which are being up-scaled and mainstreamed in the ongoing development programs. This book will help to consolidate the growing scientific literature in the state and assist budding scientists to assess the present state of knowledge. The whole book has also been made available online at the web page. To Read, Just click on the link. To Download, Right Click on the link and Click "Save Target As.."